ABOUT — Up a Tree Cup a Tea Co.
Born in 2010 in a college dorm in Florida, Johanna Parker of Up a Tree Cup a Tea Co. makes handbags using vintage and repurposed materials. Reusing vintage military tents, bank bag canvas, pennant flags, lace, and textiles to create one of a kind bags. Materials are found in barns, at auction, estate sales - all over the place! 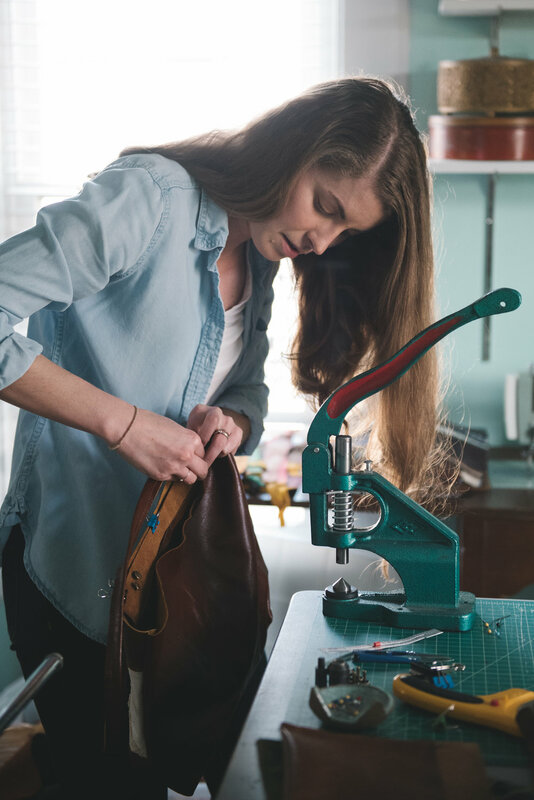 Each handbag is made using a team of heavy duty, vintage sewing machines in Johanna's in-home studio. Each handbag saves a unique piece of Americana. Johanna, her husband Lance, and daughter Magnolia live on the Outer Banks of North Carolina with their two dogs. Interested in having a family heirloom made into a custom handbag? Connect here.